Kallmann, Helmut and Edward B. Moogk. "Os-Ke-Non-Ton". The Canadian Encyclopedia, 27 March 2019, Historica Canada. https://www.thecanadianencyclopedia.ca/en/article/os-ke-non-ton. Accessed 20 April 2019. Os-Ke-Non-Ton (also written Oskenonton, meaning deer in the Mohawk language, also known as “Running Deer”), baritone, actor, spiritual leader (né Louie Deer c. 1888 in Caughnawaga [now Kahnawá:ke], QC; died c. 1955 in Lily Dale, NY). Os-Ke-Non-Ton was a celebrated singer and performer who showcased his culture across the globe. He also worked as a healer at a spiritual centre in Lily Dale until his death. 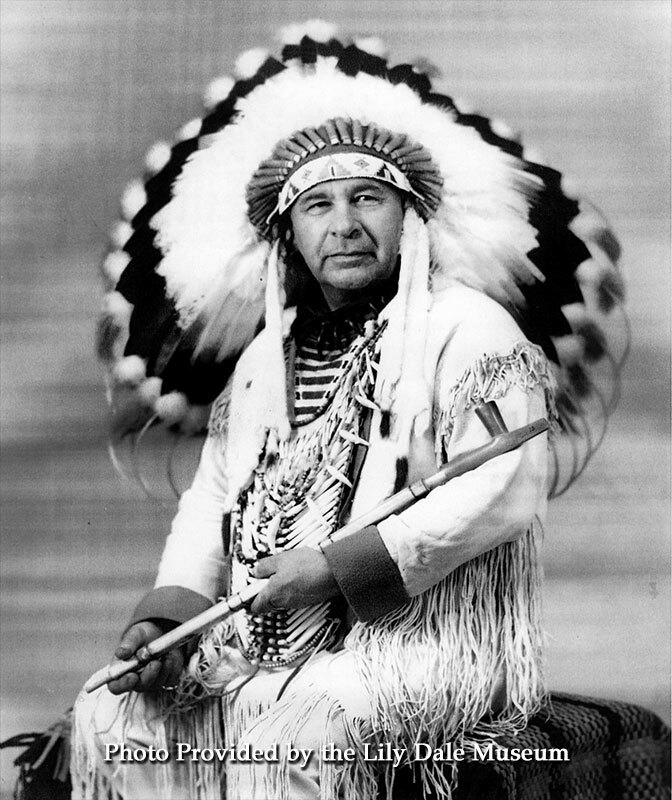 Chief Os-Ke-Non-Ton of the Bear clan of the Mohawk Nation, a well-known opera singer, performer and healer at the Lily Dale centre for religion and spirituality in New York State. Os-Ke-Non-Ton was born into the Bear clan of the Mohawk Nation. Reportedly the son and grandson of sachems (great chiefs), Os-Ke-Non-Ton went on to become a sachem himself later in life. Orphaned as a child, Os-Ke-Non-Ton was raised by his relatives and in residential school. Os-Ke-Non-Ton had a strong connection to the land, periodically hunting and camping in the forests. He also loved music and was often found singing at the beach on Norway Point in Lake of Bays Township, where he worked as a guide. Os-Ke-Non-Ton’s singing voice could be heard from outside Norway Point’s Wawa Hotel, around his campsite. It was in the woods that Toronto soprano and recitalist Leonora James- Kennedy discovered his singing talent. Moving to New York to pursue music, it was there that Os-Ke-Non-Ton began to establish himself as a professional singer and performer. Os-Ke-Non-Ton sang in the 1920s at the Canadian National Exhibition and in the Toronto ​Star​ Fresh Air Fund concerts at Bigwin Inn, Lake of Bays. Subsequently he performed from about 1924 to 1939 as the Medicine Man in Samuel Coleridge-Taylor’s play Hiawatha at Royal Albert Hall in London, England. (See also Hiawatha.) Os-Ke-Non-Ton also appeared in a 1926 production of Charles Wakefield Cadman’s opera Shanewis. Os-Ke-Non-Ton sang throughout Europe and the United States. He also performed in various off-stage productions. He was the first Indigenous person to play the voice of God from off-stage in a Broadway production. In 1924, he led a church congregation outdoors, where he and other Indigenous performers danced the Planting of the Seven Varieties of Corn. Such Indigenous performances were popular in Europe at the time; they seemed to confirm stereotypical ideas about Indigenous peoples as anti-modern. However, dressed in his regalia, Os-Ke-Non-Ton proudly showcased his Mohawk culture during these performances. Four of his 78 rpm recordings are listed in a book by recorded-sound archivist Edward B. Moogk, Roll Back the Years: History of Canadian Recorded Sound and Its Legacy (Genesis to 1930) (1975). Os-Ke-Non-Ton was a charitable person who fostered two children and gave cardigans to homeless people in Cabbagetown during the holidays. He was also vocal about First Nations’ history and culture, giving presentations on the subject in various Toronto schools. Os-Ke-Non-Ton worked as a healer at the Lily Dale Assembly in New York State. At this spiritual centre, Os-Ke-Non-Ton counselled those seeking guidance and led healing sessions in a large wigwam on the property. There is a laneway in Toronto named after Os-Ke-Non-Ton. It runs north and south between Seaton Street and Sherbourne Street in an area commonly known as Cabbagetown South. A well-travelled actor and singer, Os-Ke-Non-Ton introduced Indigenous culture to people all over the world. His work as a performer, healer and spokesperson has left a lasting influence on Indigenous arts, spirituality and culture.